How is this the first time were seeing this? 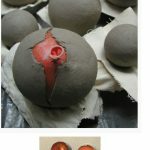 Saltwash is a a powder paint additive that creates a unique weathered look. Simply add Saltwash to any paint to create a mixture. Apply to any piece of furniture or surface to create an authentic time worn look as if weathered from years on the coast! Directions: Mix the Saltwash powder using the included scoop, to any paint of your choice. The Saltwash to paint ratio can be based on 20oz â€“ 25oz of Saltwash to one quart of paint, for desired effect. This amount can be increased or decreased depending on the amount of paint you choose to use. *Comes in a beachy reusable Tin * Included: How – To-Quick Start Guide and 2 oz measuring scoop Step 1 Apply heavily all over in a â€œglobâ€� like technique. You will notice the heavy Saltwash texture, this is good and will add to the look you want to achieve. When the Saltwash layer is half way dry and still tacky, wipe softly with a paint brush, using light paint strokes in a back and forth motion to slightly smooth down the Saltwash. These strokes should only lightly smooth out the Saltwash layer leaving the heavy â€œglobbedâ€� texture more even and only slightly smoother. If the Saltwash layer becomes to dry to smooth down, simply dampen the paint brush with water and resmooth. If you need more texture, simply reapply the Saltwash. Step 2 Once the Saltwash layer is completely dry, apply your top coat of paint. No Saltwash will be added to this topcoat of paint in this step. Reapply this topcoat of paint as desired. 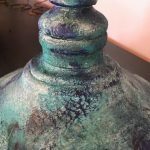 Step 3 Once your paint is totally dry, a light sanding to your final piece of furniture will bring out the underlayer details of the Saltwash and give it the multi layered and the â€œyears aged on the salty coastâ€� look and feel you want! Tips Use differing paint colors for the Saltwash coat and final coat to give contrast and really show the layers of paint. Using a higher gloss or Satin finsih for the final coat adds to an authentic look as if it was salvaged from an old beach cottageâ€¦ back when oil and lead paints were used ðŸ˜‰ Try multiple layers of Saltwash to add more interest. A light coat of wax in a brown tone will add to an authentic vintage look. Beautiful Things Come Together One Stitch at a Time Vinyl Wall Decal Words Vinyl Decal Color Chart Choices Please select your color choice from the drop down menu before adding the design to your cart. To review the color options please click on the colors thumbnail chart to enlarge. Vinyl Decal Product Details â€¢ High quality non glare matte vinyl â€¢ Easy to apply and removable â€¢ Not reusable after removed from surface Vinyl Decal Installation You will be provided with an instruction sheet along with your order and a small sample vinyl decal design to practice with. Whether this is your very first time using a vinyl decal or you are a seasoned pro, please dont hesitate to get in touch with me if you have any installation questions. Made To Order Every decal is Made to Order once purchased. This means that we will cut your design in the color you have chosen. If you forget to specify a color choice, you will be able to contact me by e-mail. Depending on how many orders are needing to be processed, it can take anywhere from 1 to 5 business days for your order to be cut and shipped out. We do our best to get your orders completed proficiently and as quickly as possible so you can enjoy your new design. may cause slight damage upon removal from some surfaces requiring paint touch-ups. may not adhere to painted surfaces with Teflon, stain guard or VOC paints that have been used. All of the advice for a long-lasting paint job on woodwork also applies to windows, but windows present a few unique challenges. Theres the glass to avoid slopping on, as well as all sorts of hardware and weather stripping. Window paint is subjected to large temperature fluctuations and moisture from condensation. And, windows have to move freely when youre all done. In this article, well show you tips on how to get the best paint job on windows with the least amount of time and effort. For every minute spent organizing, an hour is earned. Learn how these five organizers can save you time and frustration in the kitchen! The Easiest DIY Farmhouse Candlesticks. Check out this easy tutorial to see how old spindles were used to make farmhouse style candlesticks in just a few simple steps! 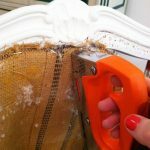 I have searched for a long time and I believe this is the BEST tutorial for a good slipcover that I have found! Yea! DIY Kids Furniture Projects â€¢ Lots of ideas & tutorials! I am not a carpenter and this was my first attempt….you may want to put some slots in the solid wood panel under your bed. This will reduce the chances of your mattress going mouldy. Or just air your mattress outside occasional. I work in a bed shop and mouldy mattresses can happen quite quickly with moisture and heat.